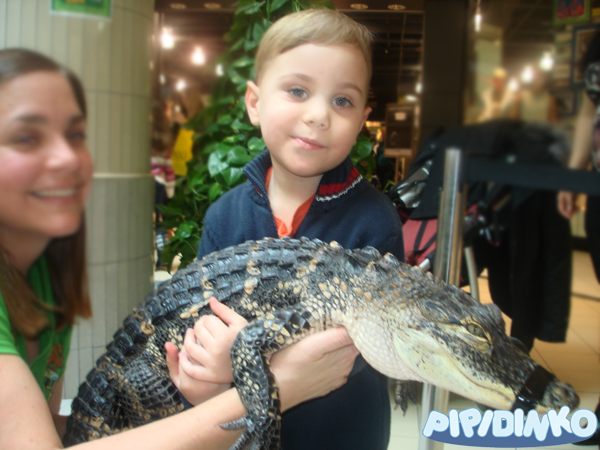 We visited a Reptilia Zoo at the Upper Canada Mall today. I loved this idea. Kids couldn't get enough of all the lizards, frogs and snakes. Santino fell in love with a few snakes and a caiman, a tiny little crocodilian. But the pinnacle of this visit was the alligator! Santino held it, and touched it, and all he could talk about after that was that he wants to have a big crocodile at home. Oh, I just hope he forgets about this idea soon. I think i want to add more of my own thoughts to this blog. They are mostly short, little brainstormings/ideas, things I come up with, while washing dishes. My way of dealing with my extreme EXTREME irritation with my son. 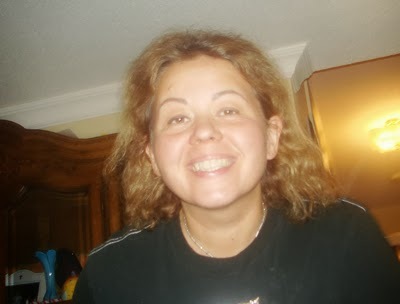 So our life with Pipidinko isn't always fun and games, not always perfect, and I am not an angel, so I do get irate. This usually happens after a 12-13 hour-long 'shift' with Santino, as he doesn't nap. In the end of the day all I wish for is some quiet time, and that means sleeping time for him. 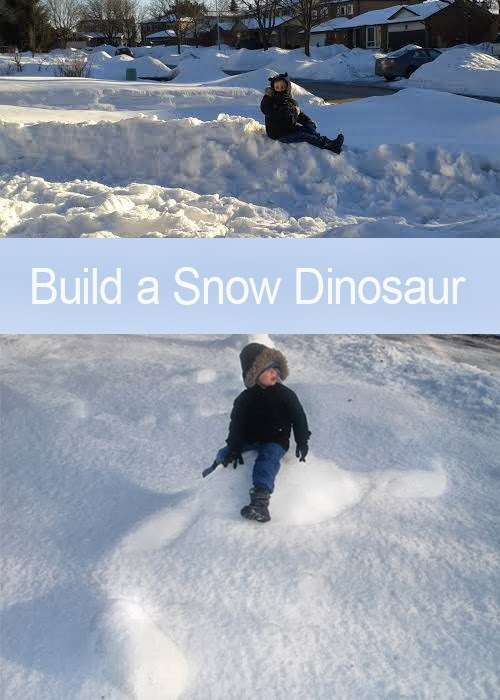 Here's another simple (all our activities are simple) dinosaur activity. We had some unbelievable amounts of snow this winter, mountains and mountains of snow everywhere. What's frustrating, is that this snow won't pack. 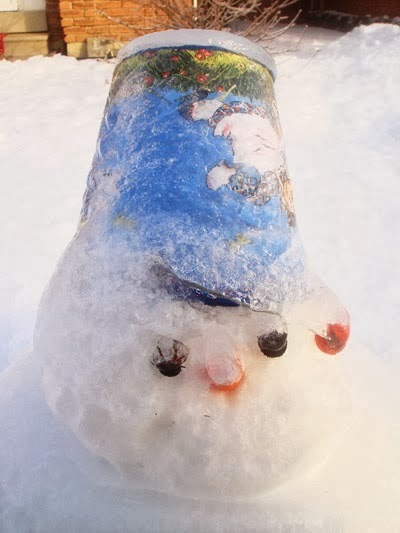 I've tried to show Santino how to make a snowman many times, but the snow always crumbles up in my hand like dry sand. We love watching Youtube channel Kids TV 123, Santino has been watching it since before he even turned 2 years old. We've watched other countless channels, too. 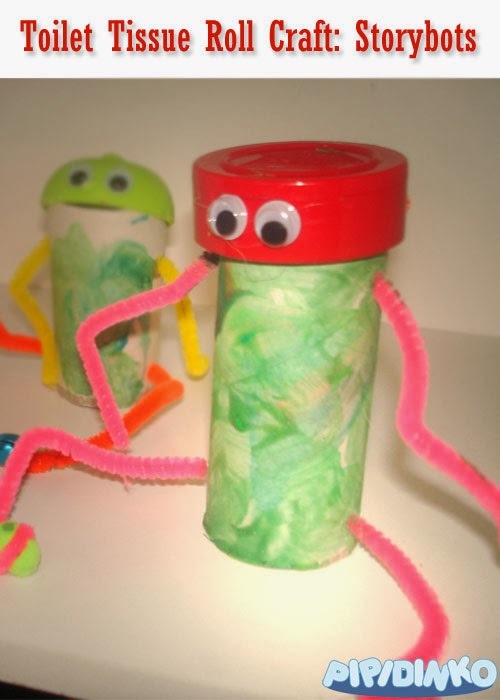 Recently, though, we have discovered another channel, the Storybots, and loved it a lot! As we were watching these fun videos after breakfast this morning, Santino sadly stated, that he doesn't have a robot. Hey, recycling craft to the rescue! 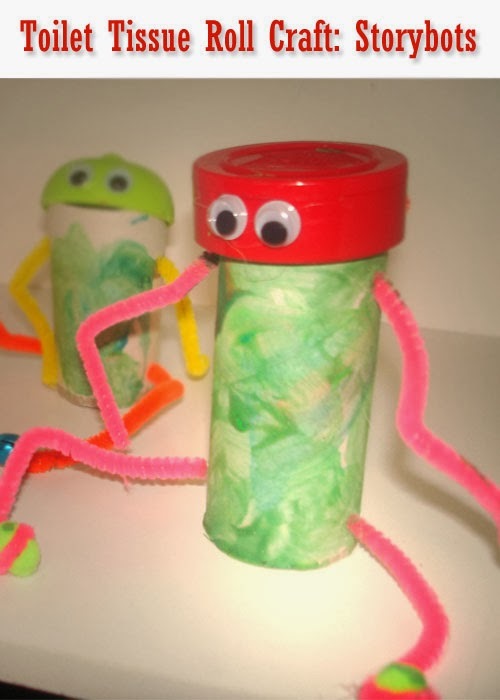 We crafted these fun storybots-looking characters. Its not that my son loves playing with toy houses. We've never had one, and when we go to the Early Years Center, he rarely pays attention to the doll house there, even though there are lots of various dolls, dressed like different professionals (doctor, policeman, etc.) and a great variety of furnishings and utensils. 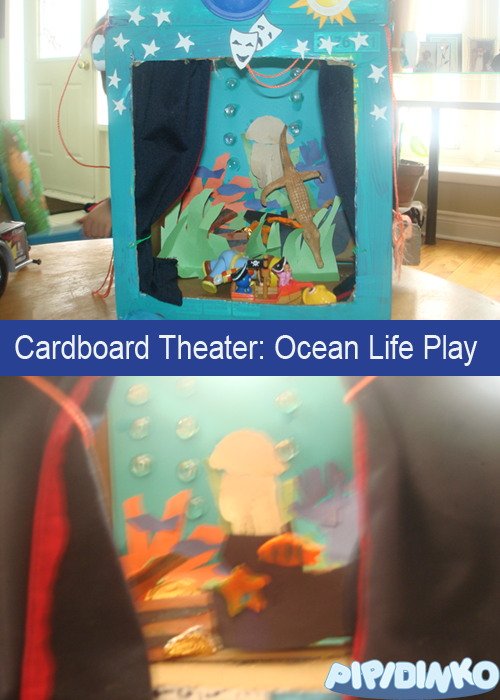 My idea for this project was to utilize the cardboard boxes, that I had collected for Santino to play with. I thought he would want to build towers or walls, but he never does. So I decided to re-purpose them. I wanted to build something "cool" like a fire station or a castle, but got side-tracked thinking how to decorate the insides of the rooms. 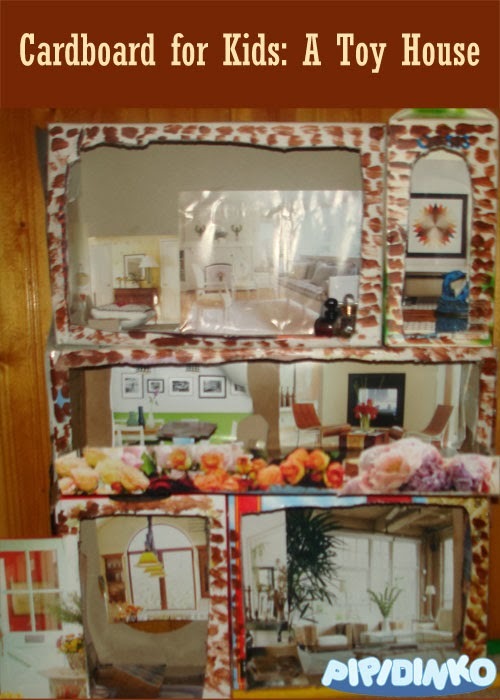 I came up with the idea to cut out photos from some interior design magazines, that I was about to throw out, and glue them to the floors and walls. Santino has a foam sword and a rocking horse, that he likes to sit on, waving the above-mentioned sword. I've been thinking about making a shield for him, especially after we've read "Franklin is Messy" book a hundred times in the past week. In this book Franklin makes his own sword and his own shield. Santino just can't get enough of this story. Today we finally did! 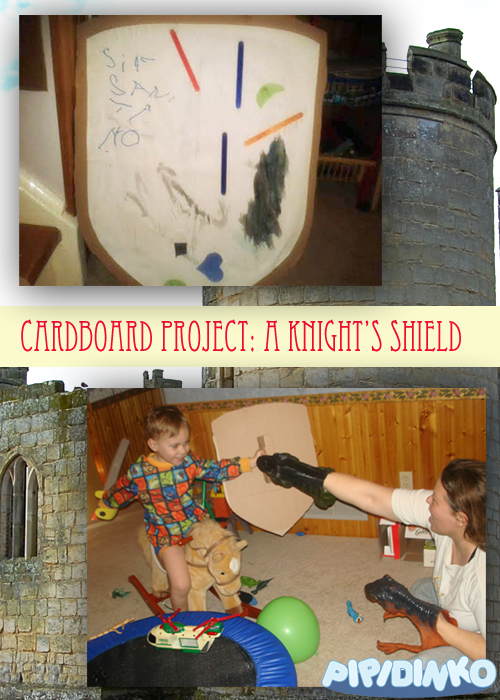 We made a shield for Santino. (c) Nataliya Di Giovanni. Powered by Blogger.